In an increasingly electronic world, it’s important to be able to keep your electronic devices secure from theft. With The Workplace Depot’s secure laptop lockers, you can keep your laptops and other devices safe when not in use. These lockers are handy to have available in public, commercial, and community spaces where employees, students, or workers might need to stash their gear. Our laptop lockers not only store your equipment, they also conveniently charge them so they’re ready to go whenever you are. 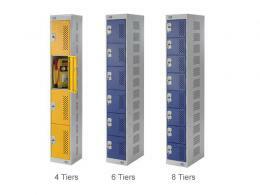 Our lockers are ideal for IT departments, office spaces, and even schools or libraries. With our Laptop Charging Units, store your laptop or devices while protecting them at the same time. Choose laptop lockers with 1, 5, or 10 doors. Each locker compartment has a 3-pin socket, so it’s compatible with all kinds of electronics – iPads, smart phones, and tablets as well as laptops. Each compartment has side vents to help prevent your device from overheating. Our Personal Item Charging Lockers come in a variety of sizes with different compartment dimensions and numbers of compartments, great for storing whatever size laptops and devices you have. Like the Laptop Charging Units, each compartment is fitted with a 3-pin socket. Perforated doors and sides helps prevent heat from building up. 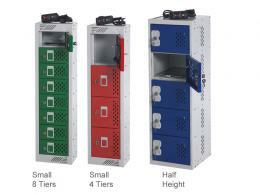 Charge and store tool batteries, electronic gadgets, and supplies in our Tool Charging Lockers. With a maximum output of 1 amp per compartment and 10 amps per locker, you can charge and store your power tools like electric drills and heavy duty batteries. All of our laptop lockers come with a one year warranty that includes parts and labour. 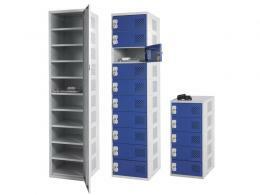 All lockers include compartments fitted with a 3-pin socket and air vents. Order today and get free delivery.